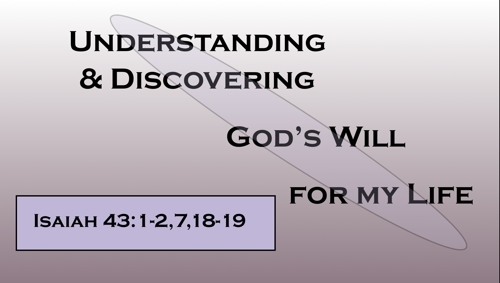 What is God's Purpose for My Life?, a Biblical study on Isaiah 43:7, is part 3 of a series, Understanding & Discovering of God’s Will for my Life, which helps us understand the two guidelines to keep us in God's will. What is this plan that God has for us? Why am I made? Let's look at 43:7 for two guidelines to keep us in God's will even in the most confusing times: Means and Motives. There are three parts to this verse. (1,3) Notice how the first and third phrase have already been stated in verse 1. Notice how verse one first spoke of forming and then calling us by name. In verse 7 He starts by calling us by His name and then speaks about forming us. The point of this is to show that in God's mind His design is not just a mechanical process. Nor is it fate which denies the importance of each individual part. 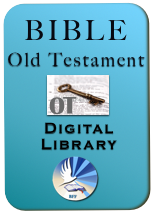 The New Testament confirms an equal emphasis on choice and relationship with the accomplishment of His plan. Note how Paul begins discussing God's great eternal plan in Romans 8:29-31. 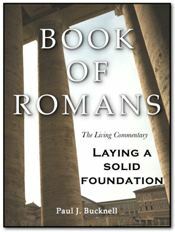 (For our commentary on Romans 8). "For whom He foreknew, he also predestined to become conformed to the image of his Son... and these He called .. justified ... glorified. "(Romans 8:29-31). We join Paul in saying, "What then shall we say to these things? If God is for us, who is against us"(Romans 8:31). We see a wonderful connection the personal touch with love and relationship perfectly blended into the comprehensive and eternal plan of God. This is again and again repeated throughout the scriptures. Let's draw some applications regarding God's will for our lives. God's will always keeps these in proper tension and so must we. Our flaw is to favor one over the other. God's purpose is to blend them together and accomplish His wonderful works. Whenever we become driven with purpose to such a degree that we ignore our spouse, children, friends or even enemies, then we have somehow misunderstood God's will. Jesus was ever so plan-conscious. He always was busy doing His Father's will, but at the same time He was very clear on the special needs of the individuals He met up with. Do you remember the time Jesus stopped to talk to a lady with a special need? He stopped and ministered to her. Meanwhile at the place where He set out to go the person died. What was Jesus' solution? He simply had the confidence that God would have to do a greater miracle! Likewise, if we become all people-oriented and forget God's plan, we likewise fail. Whenever we forget, ignore or just don't know of our purpose, then we are misdirected. We are out of alignment and need to be put back into alignment. These people need to ask not why or when but what. They need not to focus on ones feelings, desires or situation as much as simple obedience. This is why love works with mission. A cell group, family, individual, business and church must always have both a design in mind but also a sensitivity to the special needs and place of the individual. Jesus said every Christian is a part of the body. All work to a greater design. Each is important. What are you more like? Do you tend to emphasize the what and forget the who or so focus on the who you never get beyond the relationship? 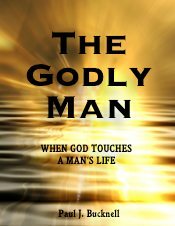 I suggest that God will probably do some of His most significant work through your life in your weaker area. Satan wants us to miss it. We need to be more alert and attentive to Him in His Word to rightly live out our lives like Jesus. "And whom I have created for My glory" (Isaiah 43:7b). We saw the first need of our lives. We need to keep an important balance between mission and love or plan and person. But we discover here another crucial element in living out God's will in our lives- the purpose. We discovered how to carry out God's will. We now need to focus on why we carry it out - the motive. God clearly expresses that he has formed man for His own glory. These other phrases were mentioned much earlier and given practical examples of how this worked out in the other verses. This phrase however was not mentioned until here in verse 7. God's point is quite clear. Unless we understand and appreciate His calling and design for our lives, we will not grasp this crucial concept. This is where the typical modern Christian faces a crisis. Do you sense the problem? We hear so much about God's love. We actually start thinking that we are the purpose for which God exists. This phrase of course reminds us of His purpose. All the things He does is for His glory including our own lives. It takes a while for us to come off our thrones and begin to recognize that God is to be praised and adored and not ourselves. We are to live for Him rather than Him for us. We can see how we can read His love wrongly and interpret all that attention as something deserved. We get everything out of perspective when we do this. But the scriptures are ever so clear. If we are called by His Name, then we are created for His glory. Let me bluntly state that the very special things that God does in and through our lives is ultimately for His glory. We are benefited and blessed when we serve Him but He is doing something yet greater. We can see the principle we just read in operation here. God is accomplishing a greater plan and yet we in our complete unworthiness are included. God's will for us then is to join Him in His great works to bring glory to His Name. If you can understand this and purposely let it shape your own goals in life, then you will be greatly lifted up by Him. Please understand the conflict that you might feel inside you. You are wondering/feeling what right does God have to have all the glory to go to Himself. This is our flesh. You see, we are sinful. We steal God's glory for ourselves. God does so much for us and yet we forget Him. Until we can confess our pride and begin to live to bring glory to Him, our lives will be in total chaos. We are fighting the inevitable for God says every knee shall bow and every tongue confess that Jesus is Lord. Instead of trying to attain our goals in life, we need to see what goals He has by which we can bring Him glory. I would like to mention a few illustrations how when we grasp this concept our lives and ministries radically change for the good. Let's look at some illustration! Before he led cell group. He was a natural leader. Someone had to do it. So he did it. But when he realized he lived for the glory of God, he translated that job to a whole different sphere of operations. Now he leads cell group to glorify God. He is not always sure how God is going to do it, but he meets with God regularly so that he will know what he needs when he needs it. He is in faith looking to how God will glorify Himself in each of the member's lives as well as through the group as a whole. Before she was trying to get the kids to be good kids. It was partly for her own image  to show that she was a good mom but also to help her child. Now, however, she has learned that God is doing something much greater in their family. God is revealing His glory through her own life and the family. She notes carefully how God is glorified when she listens to her husband rather than fighting with him. This commitment brings her to desperate praying at times because of her husband's differing decisions, but she waits on God and sees God answer wonderful prayers in ways she just couldn't believe. She also sees that she is not just trying to have a good kid but a godly one, a son that adores God and trusts in Him like David and Daniel of old. Let me give you a personal example that just happened. Our second car has been dead for six months, and ready for a funeral any day. I got an offer for $75 the other day. We learned to trust God for this. We could do it . Two days before Christmas just after delivering some Christmas presents at the post office early in the morning to our parents (yes we are a bit slow), our van died in the middle of the road. I had two choices. Some wouldn't even think there was a choice! We still had many things planned for those busy days with a large family of eight. But God said, enough was enough. But I began rejoicing in my heart that God would take care of the situation. In my prayers I delighted myself in God and told Him I didn't need any vehicles to be happy in Him. Just a few hours later after being towed to the station, I found out that the van's engine seized up. It would need to be junked or the engine replaced at literal thousands of dollars. We prayed and called out to the Lord. We purposely enjoyed our quiet Christmas even though we had many other things planned for those days. We trusted the Lord for this just like we might need groceries or money for a bill. 36 hours later on Christmas Eve, God had an anonymous love gift delivered to us. I am not sure who they were or how they even knew or even if they knew of our situation. It was enough to replace the engine. Meanwhile God has prompted individuals of the church to loan us their car or van. This is God's way of working. God wanted to bring more glory to His Name through my broken down van. My response to God about the situation would shape the whole family. If I as Dad grouched, complained or had these sour faces, we would have had a very miserable quiet Christmas. Instead our whole family saw the glory of God. When we begin to understand and accept God's way for our lives, we are radically changed no matter whether you are old or young. God has a higher and loftier goal. This is the principle that we see. For God to reveal His glory, He must do special works. He only can do these works through specially created circumstances. Unless we adjust our expectations and understandings, we will get bitter and anxious rather than excited that He is doing something for His glory. Remember God works through normal life situations. Everyone has cars that break down and frustrations to fulfill our obligations. God wants to change how we respond to them so that we can see His glorious work fulfilled. We often miss God's purpose for our lives because we miss the major guidelines. Stay inside these guidelines and you will have the peace of GOD. What are these guidelines? Means and Motive. If the way we do something is honorable to the Lord, then this will guide us to the right path in which we should go. The world says the means is not important but only the end goal. God, however, says the way we do it is a moral issue. this includes our attitudes. He examines our every step. Love is a great purpose that brings glory to God. Love is the mimicking of God's person in our daily meetings whether it be with our parents or friends. In each case we have a choice to glorify God or self.